Clean, secure wooden containers for short- or long-term Peoria storage. Fully climate- and humidity-controlled for your protection. Find solutions to your pre- and post-move storage needs with our warehouse storage options. While other movers simply wrap furniture in plastic and place it on open racks, our large wooden containers are sealed to keep out dust and moisture. Internal dividers and compartments prevent upholstered furniture items from resting on each other. Containers are stored in our secure, camera-monitored 80,000-square-foot warehouse. Warehouse storage is ideal for short- or long-term storage of furniture and other bulky items while waiting for a new home to be built, while on a temporary overseas assignment or as a step up from mini-storage. Monthly and annual leases and insurance are available. 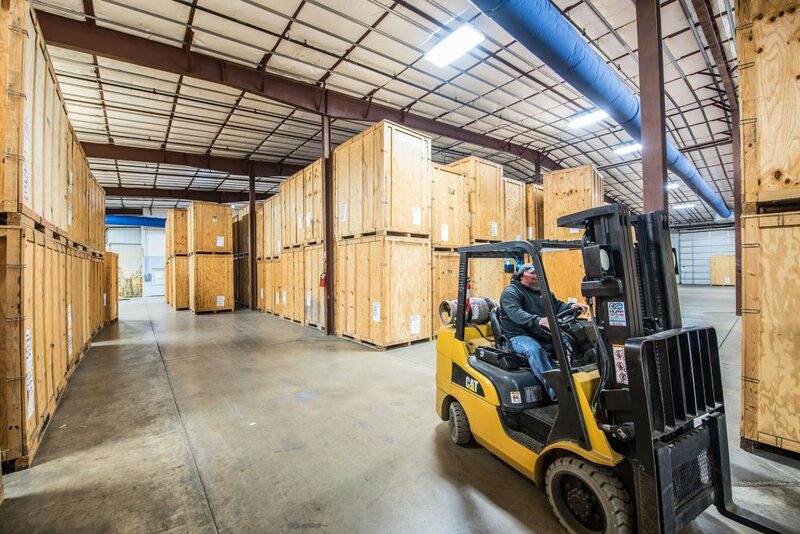 To meet the needs of our clients storing high-end furniture for extended periods, Mordue Moving & Storage recently completed a comprehensive renovation of our 80,000-square-foot warehouse. This new, highly specialized space maintains not only ideal temperature, but also features a 20,000-square-foot vault with humidity-controlled, constantly filtered and refreshed air. We believe we have the highest-quality household goods storage available anywhere. We began our renovation by sealing the space from the outside. We then lined the walls and ceiling with ultra-high-efficiency insulation and new drywall and installed insulated overhead doors. An efficiency contractor used infrared technology to determine the amount of outside air entering the building. The space measured .25 on a scale from .25 to 1.25, meaning very little outside air enters the building. Next, we installed a sophisticated, digitally controlled climate management system. Two Carrier 13-SEER, 12.5-ton industrial air conditioning systems enable precise and efficient temperature control year round. Humidity management is just as important as temperature control in keeping expensive hardwood furniture in original condition. Therefore, Mordue installed a digitally controlled humidity management system. The system enables us to maintain the ideal moisture content of 6-8% by controlling relative humidity adjusted for air temperature. To eliminate the possibility of stagnant air creating a “stale” atmosphere, Mordue installed industrial air filters as part of the HVAC system. Our system circulates 100% of the air in the space four times every hour. The MERV-13 filters capture particles in the air as small as .3 microns, 1/133rd the size of a human hair! The 20,000-square-foot vault section of our warehouse is kept under lock and key and sealed at all times. We have installed modern, high-efficiency industrial lighting and painted the walls and ceiling white to maximize visibility. When we move furniture into or out of this space, it enters another part of the building before being crated for the vault. This space is only accessed from the inside by our highly qualified warehouse employees. Multiple cameras monitor the vault at all times.